Partnering up to launch finance for smallholder irrigation. Samwel Tobiko (left) at a Winrock/ Futurepump training of Juhudi Kilimo loan officers. In Kenya, 80 percent of the population derive their livelihoods from agriculture, yet the share of agricultural finance in national credit is below 5 percent. Juhudi Kilimo, a Kenya-based microfinance institution, aims to address unmet demand for agricultural lending by focusing on rural smallholder farmers. Juhudi, through its Juhudi Labs division, recently joined with Winrock to launch one of the first credit facilities for solar irrigation in the country. Juhudi Labs has successfully piloted financing for cookstove and solar light products, and was immediately interested when Winrock suggested creating a smallholder solar water pump loan product. As a team, we saw smallholder solar water pumps as a critical tool for rural poverty alleviation in Kenya. Solar water pumps are low-cost, robust and portable, and offer farmers a cheaper, cleaner and more sustainable alternative to diesel pumps. We knew this, but the farmers who use diesel-powered water pumps or no irrigation at all didn’t even know a solar alternative exists. So before Juhudi started thinking about delivery, we had to figure out how to get this product discovered. Winrock had already tested the technology and completed case studies on several farmers successfully adopting it. Those farmers would become ambassadors for more farmers who needed to see it to believe it. Together we structured a partnership with solar pump retailer Futurepump, introduced a new credit line and began raising awareness — first by training Juhudi staff and then by educating farmer groups. For the next three months of the pilot, Futurepump assigned two sales reps to work alongside Juhudi’s team of loan officers at the Kitale branch. The sales reps delivered a strong pitch to farmer groups and ran demos, while loan officers did credit appraisal and processed applicants’ loans. Those months provided us with a ripe testing environment to learn from our mistakes and take this small pilot on to the next level. 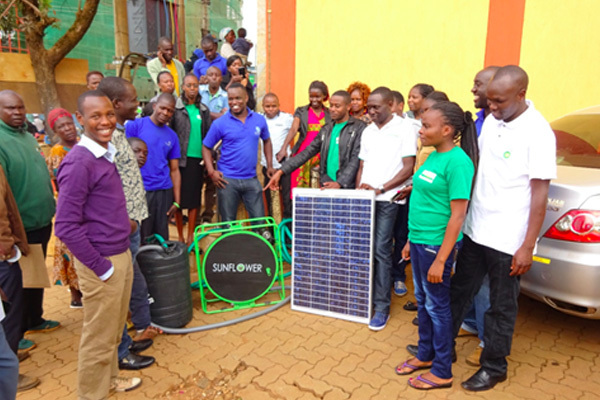 We discovered that the solar water pump is a crowd-pleaser; the pitching and demos were a success in drumming up customer excitement. However, in sales conversion, the product fell short of expectations. For one thing, solar water pumps are a push product. Juhudi would need to proactively pitch and run demos to get the product discovered. For another, many farmers found the product to be expensive. Average loan size at Juhudi is $330 and Futurepump costs significantly more. Many farmers need a bundled solution that includes pipes and drip irrigation lines, further increasing the overall cost, and some farmers needed a stronger pump for deeper boreholes. Expand the pilot to 1 year. If there’s anything the credit business has taught us, it is that the appetite for credit is cyclical. We see higher demand for credit at the end and beginning of the year. Extending the pilot period to one year ensures that we’ll observe the demand for this product throughout the agricultural season. Take it to multiple branches across different counties of Kenya. By expanding the pilot to at least 10 field branches, we can gauge the potential of the product in different geographic regions with distinct climatic conditions. Also, failing to fully secure staff buy-in at a branch may kill the potential of a product. Innovate on the technology offering. We added a new solar water pump product with a battery, so that farmers can work the pump very early and late in the day, or even in cloudy weather. The product also has a higher lift and a lower price point. Broaden the concept of solar irrigation to holistic water resource management. We learned that sometimes farmers want to invest in an irrigation kit or water tank before purchasing the water pump. To incorporate that decision-making, we will include “smart water” solutions, such as water tanks, irrigation kits, wells and water filters, as well as staff training on technical water resource management topics. Hire dedicated staff. We hope to hire at least six loan officers whose key performance indicators would be selling these products alongside the traditional parameters common across Juhudi loan officers. Although these newly hired staff will have the power to form new groups and disburse loans, they will also be tasked to sell to the existing portfolios of our loan officers. Introduce incentives for farmers. In the last pilot, we introduced staff incentives. We now want to take it a step further by targeting farmer group officials to market this product for us. They will now be rewarded for successful sales conversions, helping spread sustainable water solutions far and wide across Kenya. From this collaboration with Juhudi, Winrock learned that financial intermediaries need to see a variety of solar pump products and that technology assessments by a neutral third party ensure the quality of products being promoted to smallholders. To learn more, click here.